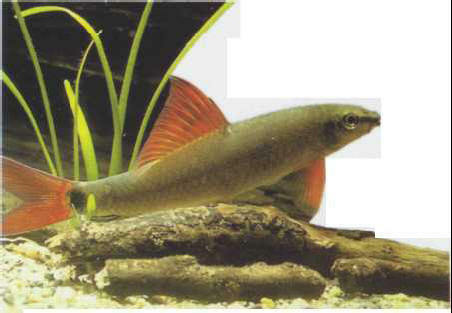 The red-finned shark or rainbow shark is distinguished from Labeo bicolor by a less intense body coloration and by its red fins. Sometimes a commercial albino variety is found, which can be mated with the normal variety; the fry will then display the coloration of one or other of the parents. Size: 10-15 cm.